All event handling is done synchronously, so you don’t have to bother with eventual consistency and all that stuff, instead you can just focus on the core event sourcing concepts. Also, the result is actually a hybrid mutable state / ES solution, since there’s still some data stored in table rows. We didn’t feel it was worth the effort to completely move to event sourcing for this dojo, though it might be a fun exercise. You can have a look at the code on github. Please note that this infrastructure is not production-ready nor production-tested, so keep that in mind if you want to base your own infra on this code. With the above code available at the start of the dojo, we set up a couple of exercises for pairs to tackle during the evening. Spoiler alert: the following description of the exercises might contain partial answers to the exercises; if you want to do the dojo please consider doing that first. With RSVPing already in place, canceling is the next logical step. In this exercise you can explore how event sourcing works in the RSVP case, and try to apply that to canceling. It ends up being more or less a copy-paste exercise, but one that lets you quickly explore the various steps involved. In the dinners details screen we’d like to show an activity history, with entries for RSVPs, cancelled RSVPs, location changes, etc. This is very easy to implement using event sourcing, but hard using mutable state based persistence. In fact, in the latter case you probably end up persisting event-like things. The goal of the exercise is to show how event sourcing helps you do useful stuff that is otherwise hard to implement. In the original application, updating details for the dinner was very CRUD-y. You would have one form in which all details could be edited and then saved. This approach doesn’t work particularly well with event sourcing since you’d usually want the events to express more intent than just “Dinner Changed”. To do so, you usually build a task-based UI, with explicit commands for certain (domain) operations. In this exercise that domain operation was changing the address of the Dinner (in hindsight the operation maybe should’ve been called ChangeVenue). The goal was showing how using event sourcing might end up requiring changes to the UI. It’s a list of dinners sorted by RSVP count descending. Producing this list efficiently with event sourcing is harder than in a mutable state based scenario, because we don’t have the current state readily available to query on. Since we now need to sort globally on all dinners, we would have to fetch all dinners and events and then do the sort entirely in memory. That could become a problem if we have a lot of dinners in our system. So in this exercise the goal was to listen to the RSVPed and RSVPCanceled events and build a separate read model for keeping the count of RSVPs per dinner, and use that to sort the list. We expected this exercise to take most time, but a few pairs managed to finish the exercise within the allotted time (about 2.5 hours for all exercises). Please do try this at home! All in all, I think doing the above exercises could be a good introduction to event sourcing, and most of the people that attended agreed. 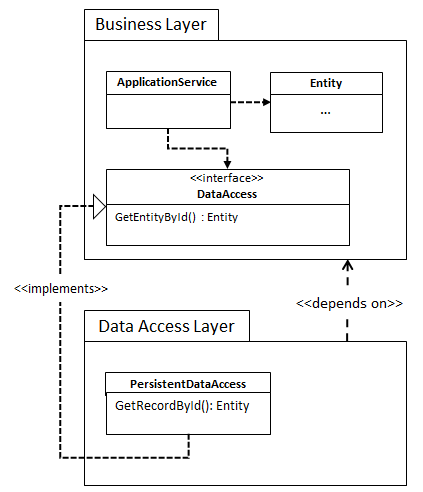 I wrote about the dependency inversion principle (DIP) a couple of weeks ago and got some questions about the practical implementation issues when applying it in a .NET environment, specifically how to apply it when using Entity Framework (EF). We came up with three solutions, which I’ll detail in this post. Note that even though this post is written for EF, you can probably easily extrapolate these strategies to other data access tools such as NHibernate, Dapper or plain old ADO.NET as well. When trying to implement this with EF, you’ll run into an interesting issue: where do we put our entity classes (the classes representing the tables)? Both the business layer and data access layer are possible, and there are trade-offs to both. We’ve identified three solutions that we find viable in certain circumstances, and that’s exactly the topic of this post. For the sake of this post we’ll use a simple application that handles information about Users. The Users are characterized by an Id, Name and Age. 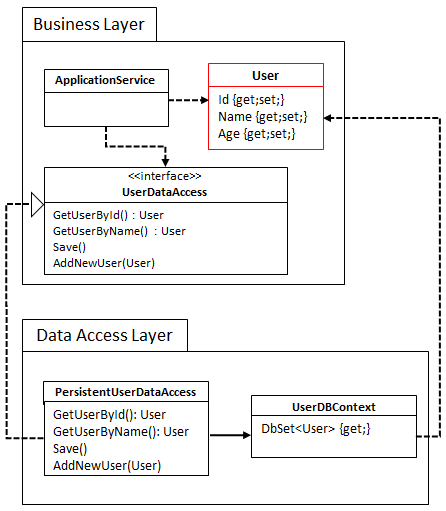 The business layer defines a UserDataAccess that allows the ApplicationService classes to fetch a user by its id or name, and allows us to persist the user state to disk. Note that this is pretty fragile since we need to run this check every time we add some functionality that creates or updates a username. The addition of the new User to the context together with the fact that Save doesn’t take any arguments is a clear manifestation that we expect our data access implementation to implement a Unit of Work pattern, which EF does. It should be clear that this style maintains a pretty tight coupling between the database and object representation: our domain objects will almost always map 1-to-1 to our table representation, both in its names and its types. This works particularly well in situations where there isn’t much (complex) business logic to begin with, and we’re not pursuing a particularly rich domain model. However, as we’ve already seen, even with something as simple as this we can already run into some duplication issues with the usernames. I think in general this will lead you to a more procedural style of programming. The full source to this example is available in the DIP.Interface. * projects on GitHub. The current version of EF (6.1) handles this structure without problems, but older versions or other ORMs might not be so lenient and require the entities to be in the same assembly as the DbContext. 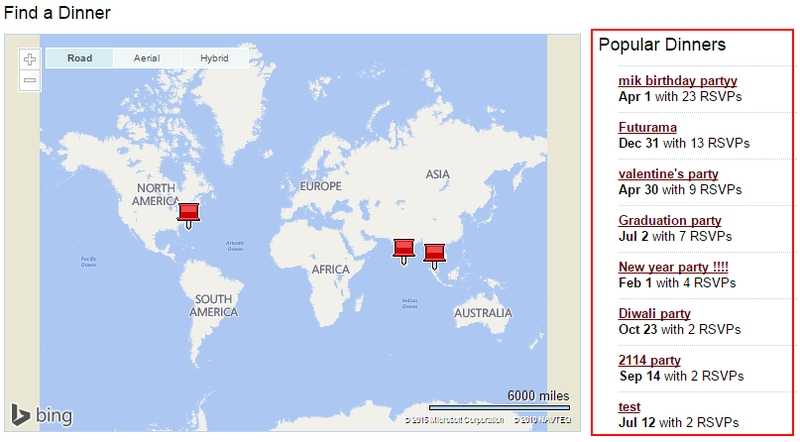 I think this is probably a bit less clean and discoverable than the annotated version, but it’s still workable. Just as with strategy 1, there is still a large amount of coupling between our table and object structure, having the same implications with regard to programming style. We did, however, manage to remove the IUser type from the solution. In situations where I don’t need a rich domain model, I favor this strategy over the previous one since I think the User/IUser stuff is just a little weird. The full source to this example is available in the DIP.EntitiesInDomain. * projects on GitHub. This is the most flexible solution of the three: we’ve completely isolated our EF entities from our domain objects. This allows us to have properly encapsulated, behavior-rich business objects, which have no design compromises due to data-storage considerations. It is, of course, also more complex, so use it only when you actually need the aforementioned qualities. Using rich domain objects like this is extremely hard (if at all possible) with the other strategies, but can also be extremely valuable when designing business-rule heavy applications (instead of mostly CRUD). In general, this style will be more work but the gained flexibility can definitely outweigh that. The full source to this example is available in the DIP.DataMapper. * projects on GitHub. 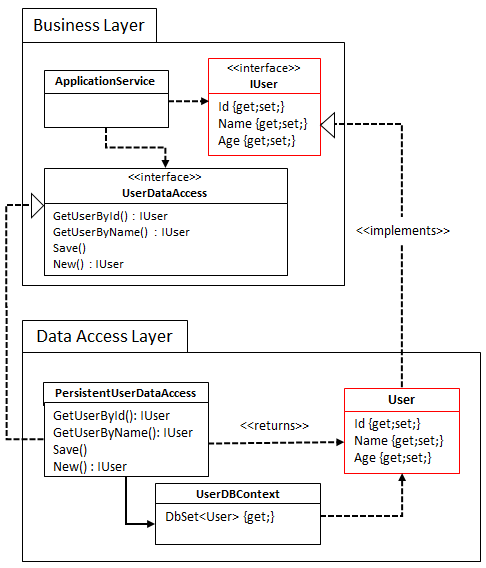 In this post we explored 3 strategies for applying the Dependency Inversion principle to Entity Framework in .NET based applications. There are probably other strategies (or mixtures of the above, specifically wrapping EF entities as state objects in DDD) as well, and I would be happy to hear about them. I think the most important axis to evaluate each strategy on is the amount of coupling between database schema and object structure. Having high coupling will result in a more easy/quick-to-understand design, but we won’t be able to design a really rich domain model around them and lead you to a more procedural style of programming. The 3rd strategy provides a lot of flexibility and does allow for a rich model, but might be harder to understand at a first glance. As always, the strategy to pick depends on the kind of application you’re developing: if you’re doing CRUDy kind of work, perhaps with a little bit of transaction script, use one of the first 2. 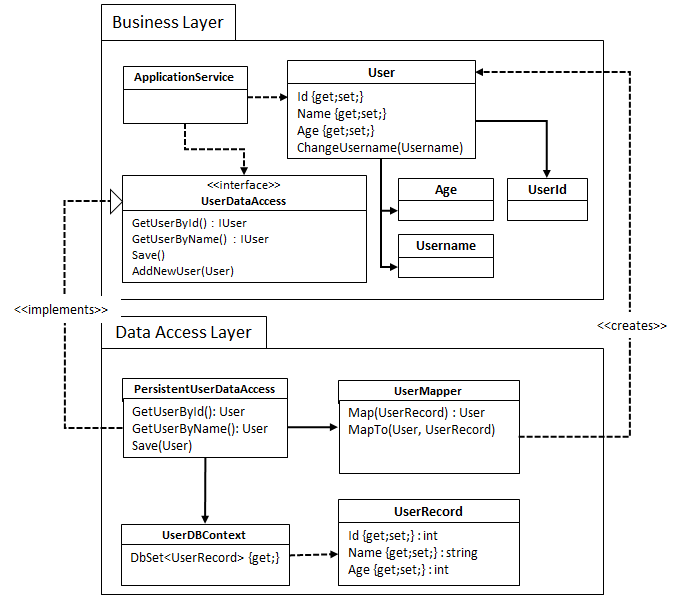 If you’re doing business-rule heavy domain modelling, go for the 3rd one. All code (including tests) for these strategies is available on GitHub.